The Pure Flix Entertainment production company recently rocked the Christian film market with the noxious overperformer God’s Not Dead. Now, on the heels of this year’s less successful Do You Believe?, comes Faith Of Our Fathers. The film is stocked with a relative supergroup of participants from the Christian market both above and below the line: Like most of the cast, director Carey Scott is a regular actor in such films, and one of the editors, Alex Kendrick, was (along with brother Stephen) primarily responsible for opening up the theatrical market with Fireproof and subsequent follow-ups. It’s been a long time since anyone tried to seriously argue that the Vietnam War was a good thing, even if agreement across the political spectrum may differ as to the precise extent and reasons it was a calamity tactically, socially, morally, and politically. 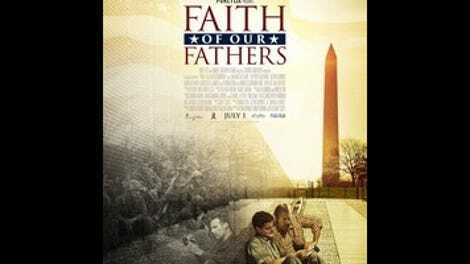 With Faith Of Our Fathers, Scott and his all-star team burden themselves with the dubious task of demonstrating that at least some good came out of the quagmire: There were believers in ’Nam who brought fellow grunts to Jesus in their final moments, so it wasn’t a total wash.
John Paul George (Kevin Downes) never really knew what happened to his Vietnam soldier father, who died in combat. 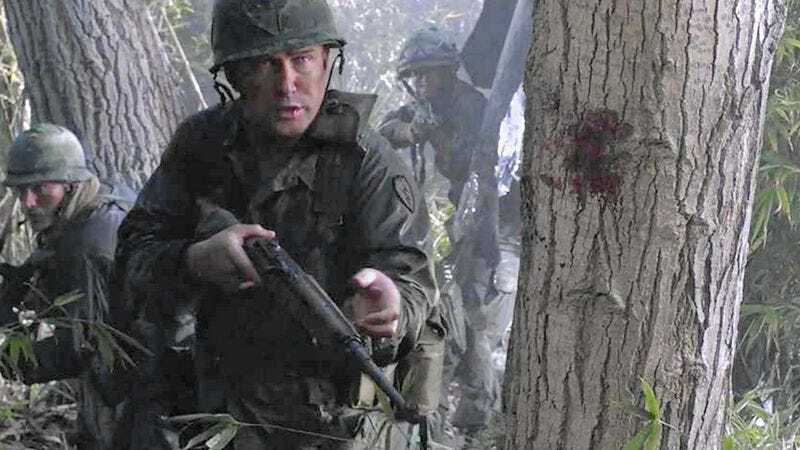 After going through his late mother’s boxes, he tracks down a fellow soldier to a Mississippi address. There, John Paul George (yes, “like the Beatles,” a comic relief line deployed every 10 minutes or so) meets Wayne (David A.R. White), his counterpart in every obvious, reductive way: John Paul George is a clean-living California Christian, Wayne an uncouth redneck atheist who’s chewing a toothpick when he’s not wiping his mouth with his sleeve. Together their first names add up to “John Wayne,” meaning they’re presumably the yin and yang of American masculinity, as false a binary as could be. Since Wayne has letters from his father that could explain what happened to John’s, he’s got all the leverage in the relationship and demands that, in exchange for reading the letters, the two drive to the Vietnam Memorial in D.C. The buddy road comedy portions are a clear, unsuccessful riff on Planes, Trains And Automobiles, with proud hick Wayne relentlessly tweaking absurdly uptight JPG as conspicuously poor green-screen backgrounds roll by. The film presents this relentless harassment as funny and a good thing (per cameo-ing Australian Christian pop singer Rebecca St. James, he’s being treated “like a little brother”), a decent way to toughen up a prissy man who’s always being pushed around by his materially obsessive fiancée Cynthia (Candace Cameron Bure). She’s always calling to ask about flowers and meetings with the videographer rather than setting aside her worries about a wedding (in three weeks!) to focus on her man’s needs. Her lack of sensitivity and overall domestic worthiness is foreshadowed early on by her inability to cook a proper dinner, and she later repents of her impatient ways. In Class, the late Paul Fussell observed that “probably the most awful class division in America, one that cuts deeply across the center of society and that will poison life here for generations, is the one separating those whose young people were killed or savaged in the Vietnam War and those who, thanks largely to the infamous S-2 deferment for college students, escaped.” That division doesn’t exist here, nor does any other lingering national psychic fallout that might make Vietnam different from any other conflict. There’s certainly no worry that stopping things dead so Duck Dynasty patriarch Si Robertson can plug his family’s beef jerky might in any way compromise the film’s moral stature. After all, he’s a Vietnam vet and he’s not bitter—why should anyone else be?